Writer’s Note: The Idol-Head of Diabolu, a Martian Manhunter blog was invaluable in the creation of this article! Visit them today. David Goyer, the scribe behind Man of Steel and its sequel Batman v Superman: Dawn of Justice, recently drew criticism for comments regarding the Martian Manhunter. Painting the character as silly from his name to his modus operandi, the statement heaped even more backlash from fans that panned Man of Steel and decried seemingly every new announcement about the sequel (be it the casting of actors like Ben Affleck, Gal Gadot, and Jesse Eisenberg to the very title of the upcoming film). Several sites have cited part of the problems with Man of Steel and choices made about its sequel could come from a lack of understanding of the source material, the statement given by Goyer another in a series from the scribe and director Zack Snyder that may have some basis for the claim. Considered somewhat less than an A-list character, lets take a look at the Manhunter from Mars. The character of Martian Manhunter was very much a product of his time. 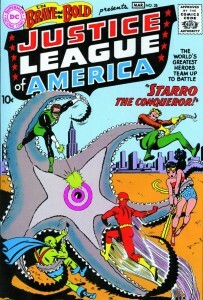 Following the collapse of the American comic book industry in the 1950s due to the efforts of those like Fredric Wertham and the United States Senate Subcommittee on Juvenile Delinquency, remaining publishers like National (DC Comics) and Atlas (Marvel) were largely the only game in town. Because of the furor generated by Wertham, genres like superheroes, Crime, and Horror were virtually dead (or castrated) as only the likes of Superman and Batman could hang on (and even then, Batman held on by a thread). 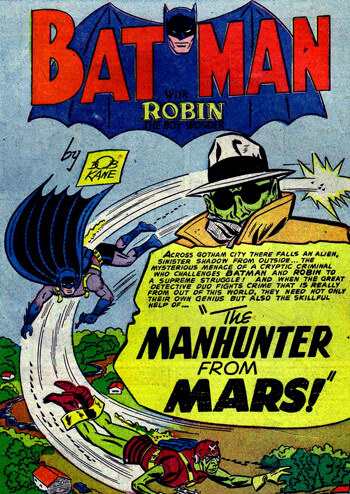 Considering the success of Superman, the Batman books began delving rather heavily into Sci-Fi and on one occasion teamed up with a certain lawman from Mars. Roh Kar was the only lawman on his peaceful planet of Mars (inspired by the heroes of Earth he observed from afar). When a villain named Quork emerged, Roh Kar chased him eventually landing on Earth. Therein, Batman, Robin, and Roh Kar brought the villain to justice. At a time when Sci-Fi and Crime stories were more desirable than superheroes, Roh Kar’s character seemed to strike a chord with someone as two years later elements of the character were reworked and so was born J’onn J’onzz. Emerging as a back-up story in the pages of Detective Comics, “The Strange Experiment of Dr. Erdel” detailed the arrival of J’onn J’onzz on Earth when scientist Dr. Saul Erdel teleported the Martian from his planet in a bid to discover alien life. Erdel reveals his device would have to be drastically altered, perhaps over the span of years, to return the alien to his homeworld before the strain of the event killed the scientist. Marooned on Earth, J’onn (a scientist on his homeworld) recalls his planet being on track towards interplanetary travel and decides to bide his time until then playing the part of a police detective until he could return home to his family. 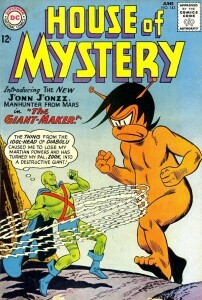 Taking the identity of John Jones, the so-called Manhunter from Mars fought organized crime in the city of Middleton, Colorado before members of his race began emerging on Earth (J’onn a greenskin, there were also the yellowskins and whiteskins) finally giving him the means to return to Mars. However, J’onn felt he was making a difference on Earth, observing it as a culture not unlike Mars during its formative years. So, he decided to live on Earth and visit his world on occasion. A year after the Manhunter from Mars emerged, the editors at National decided to give superheroes another chance (largely along the Sci-Fi thread which was popular with readers). Julius Schwartz, an agent for Sci-Fi writers (as well as former Sci-Fi fanzine publisher) who became an editor at National, was tasked with reviving heroes. Schwartz oversaw writers Robert Kanigher and John Broome with artist Carmine Infantino re-imagine the Flash for a new age thus beginning the Silver Age of Comic Books. Soon after came Green Lantern, Hawkman, and the Atom leading to the Justice League of America. 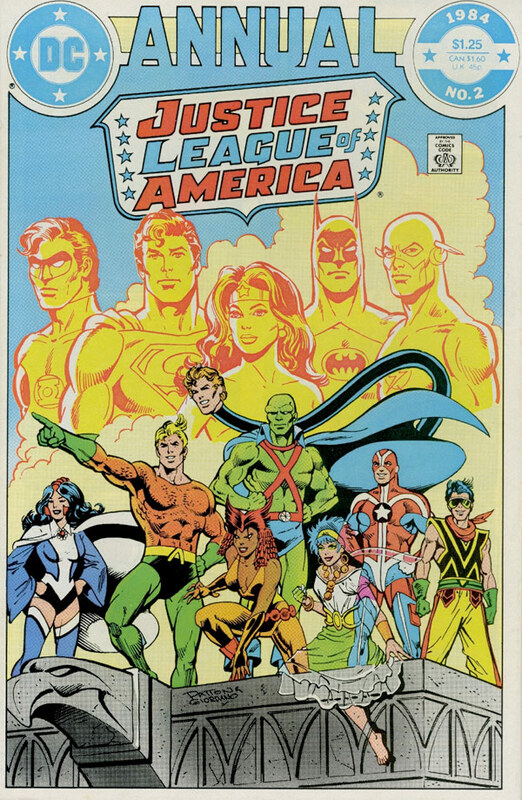 A re-imagining of the Golden Age Justice Society of America, the League brought together Superman, Batman, Wonder Woman, the Flash, Green Lantern, Aquaman, and the Manhunter from Mars (shortened to Martian Manhunter). 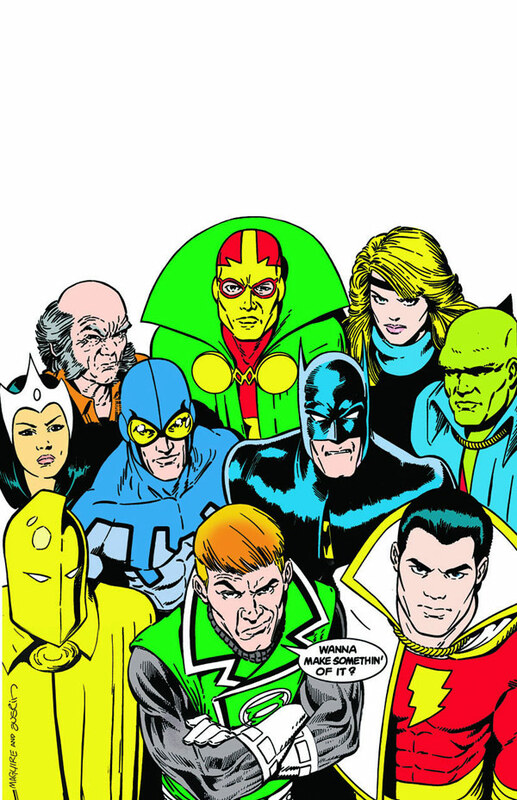 J’onn was the only founding member of the League not based on a Golden Age version. This was due to an idea amongst the editors that kids would get burned out on seeing characters like Superman and Batman appearing in another book in addition to those they already starred within (which in another manner pays homage to the Society because while Superman and Batman were officially members, they rarely ever appeared with the team as they belonged to a separate publisher under the same umbrella at the time). So, Martian Manhunter would be a stand-in for Superman (and later Green Arrow for Batman) as both of their powers were vaguely defined meaning for the confines of the story, anything Superman could do so could J’onn (initially, Manhunter relied on shape shifting and his telepathic abilities before his abilities were wildly expanded upon). Though, while Superman was weak against Kryptonite, the Martian Manhunter was weak against fire when in his Martian state. 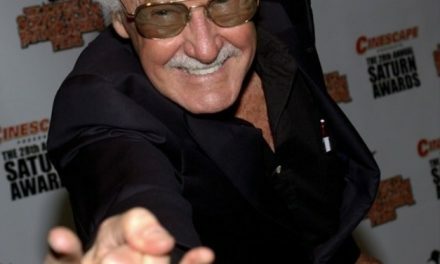 Despite the rebirth of superheroes in the comics industry (according to Stan Lee, the Justice League inspiring the creation of the Fantastic Four which returned superheroes to the burgeoning Marvel Comics), sales of Batman’s titles continued to do poorly. Martian Manhunter, who had been a regular back-up series in Detective Comics for nine consecutive years, had started fighting supervillains in his stories before an editorial shift saw Julius Schwartz being brought in to save the once great Batman franchise. 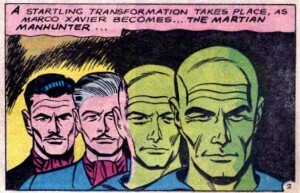 As the Elongated Man (loosely based on Dashiell Hammett’s Thin Man) replaced Martian Manhunter in Detective, outgoing editor Jack Schiff made J’onn the star of the Horror comic book series House of Mystery (around this team, Martian Manhunter and Green Arrow would appear alongside each other in The Brave and the Bold which would then change its format to a team-up book). 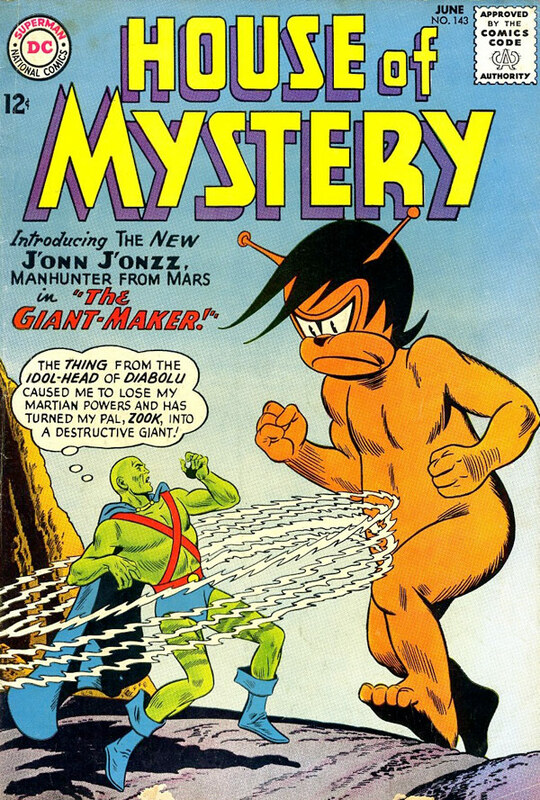 The series initially featured Martian Manhunter’s first nemesis in the Idol-Head of Diabolu, an ancient artifact of a powerful wizard that summoned terrors upon the world. As the concept didn’t seem to catch on with viewers after almost two years, it was dropped in favor of J’onn becoming a sort-of secret agent for the US government (following the success of the James Bond films and Marvel re-branding Nick Fury as a secret agent). Having lost his John Jones identity when the Idol-Head of Diabolu emerged, J’onn assumed the guise of wealthy adventurer Marco Xavier whom the Martian witnessed died in a car accident. J’onn as Xavier battled the international criminal organization VULTURE (amidst a fan backlash decrying the bleak direction of J’onn’s character) eventually discovering not only was Xavier alive, he was the mysterious head of VULTURE called Mr. V who faked his death aware he was under surveillance. 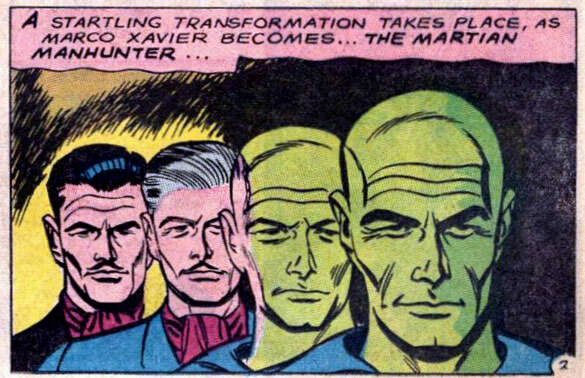 When J’onn then became Xavier, Mr. V decided to let the masquerade continue in hopes of setting a trap for the Manhunter. When this succeeded, Xavier planned to use an experimental weapon to kill his enemy only to seemingly disintegrate himself. The resolution of this story was the end of a two year journey of the Martian Manhunter as a secret agent. More importantly, it was the end of a thirteen year run of continuous solo Martian Manhunter stories when the character was taken out of House of Mystery (the series reverting to a Horror anthology again). The pages of Justice League of America would introduce the android Red Tornado who took the place of Martian Manhunter when he returned to Mars. Continuity was re-arranged such that J’onn’s time on Earth was purposeful as something for him to do while he was exiled from Martian society for thirteen years by its white Martian leader Commander Blanx. When his sentence ended, J’onn simply used Erdel’s device to go home. Further changes included, like Kryptonians in a manner, Martians had no powers on their planet and Earth’s science was in fact more advanced than that of Mars. When J’onn returned home, most of his race was wiped out by Blanx and he begged the League to help him save his planet’s last survivors. The League bested Blanx as a space-faring vessel J’onn oversaw construction of being built saved remnants of Martian society who landed on the planet Vonn to begin anew as Mars II. For about sixteen years, the Martian Manhunter had disappeared from DC Comics with only a handful of guest appearances during that time. A writer emerged who had an idea for a new character named J’em who would be J’onn J’onzz’s cousin that fled to Earth following a coup by the White Martians on Mars II. A maxi-series called “Jemm, Son of Mars” was produced but ran into a major editorial snag. About the same time Jemm was set to hit stands, a storyline was in the pipeline having not only Martian Manhunter return to the Justice League, but a war between Earth and Mars II with its Green Martians. Jemm was hastily reworked into Jemm, Son of Saturn as J’em went from being a Green Martian to Red Saturnian in conflict with White Saturnians (with his cousin J’onn instead then Jogarr). As mentioned, J’onn returned and following the end of the “Earth/Mars War” storyline, he was yet again an exile from his people. Shortly thereafter came what many consider the Justice League’s worst incarnation in the Detroit era. This turn saw disgust by Aquaman about how many Leaguers were unable to devote significant effort toward League duties. 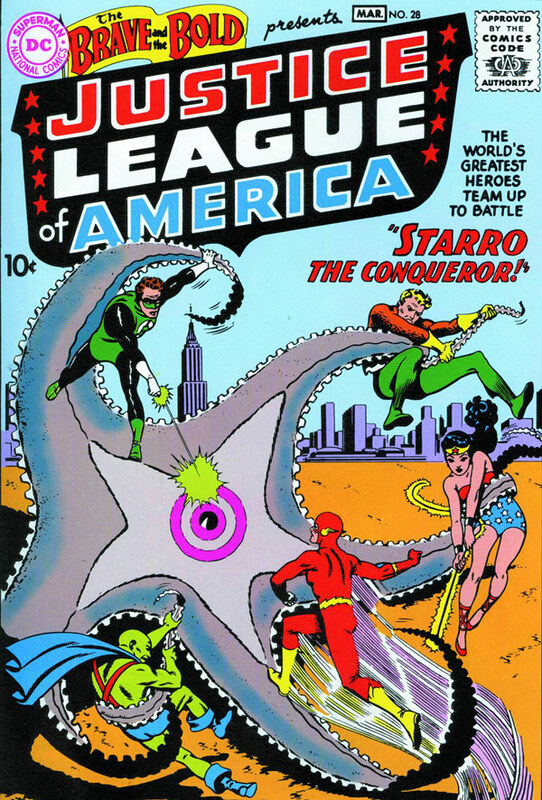 So, only full time Leaguers were permitted as Aquaman took over the team seeing the likes of Superman, Batman, Wonder Woman, the Flash, and Green Lantern booted out in favor of Elongated Man, Zatanna, Martian Manhunter, and new recruits Vixen, Gypsy, Steel, and Vibe. In reality, DC Comics saw its position as the industry’s leader continue to shrink as Marvel was attracting the youth with franchises like Spider-Man and the X-Men (Marvel moving ahead of DC in sales in the 1970s). 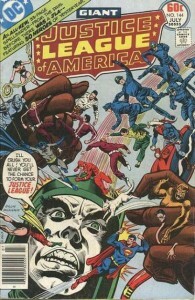 The Detroit League was an effort to attract young readers with young characters of different skin colors and backgrounds. The group hobbled along for a couple years (Aquaman leaving after a few issues as J’onn assumed leadership) before Steel and Vibe were killed off and the Justice League was reshuffled in wake of the Legends event (DC’s first event following the Crisis on Infinite Earths). 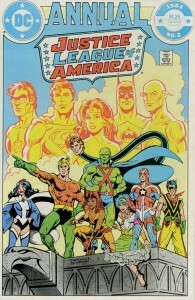 Following Crisis, it was decided the trinity (Superman, Batman, and Wonder Woman) would retroactively be taken out of the Justice League of America. Not only were the trio not founders, editors didn’t want the three to be in the current or upcoming post-Legends incarnation of the group. 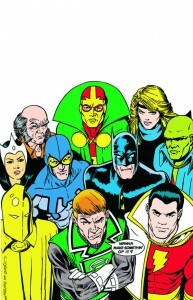 Writers Keith Giffen and J. M. DeMatteis were brought on initially with a desire to return to the seven founding members only to learn the circumstances with the trinity as well as the Flash and Aquaman were also off-limits. Batman editor Denny O’Neil however took pity on the crew and allowed them Batman. Considering their Big 7 concept was wiped out, the writing duo decided to make the series comical instead of its traditional serious tone. Because of this, Green Lantern editor Andy Helfer recommended Guy Gardner over Hal Jordan as the team’s Lantern which the pair accepted. The team consisted of Batman and Martian Manhunter with Guy Gardner, Black Canary, Captain Marvel, Blue Beetle, Booster Gold, Doctor Fate, Mister Miracle, and Doctor Light (editorial would shortly thereafter pull Marvel from the book in an attempt to relaunch his franchise). Among the dysfunctional group, Martian Manhunter served as the straight man amongst the hilarity (initially led by Batman, the Dark Knight turned over the reins to J’onn as leader a short time later). 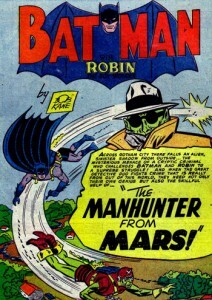 The Manhunter from Mars himself was changed by Crisis, now the last survivor of Mars, his weakness to fire actually a psychological fear of fire, his true form a tall, thin humanoid (opposed to his beetle-browed appearance being his true form), and while the current age of superheroes depicted in DC Comics was relatively new (circa-late 1980s), J’onn retroactively operated on Earth in secret since the 1950s (as his Mars II backstory was wiped out and Manhunter assumed Superman’s historical role in the League, J’onn retroactively was the group’s longest serving member). Also, Erdel had in fact survived his encounter with J’onn. Manhunter’s post-Crisis origins would be explored in his own 1988 mini-series. 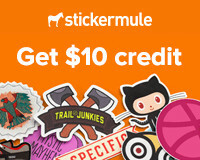 Go to the next page below….